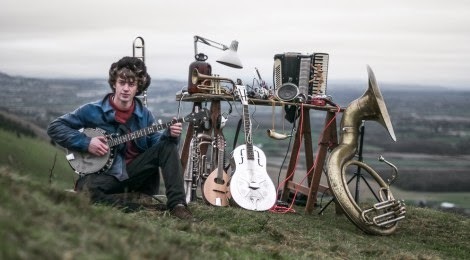 I was rather enraptured when I caught one man experimental percussive pop master Cosmo Sheldrake at Southsea Fest earlier in the year. Sheldrake has emerged as an increasingly formidable solo artist in 2013 and here he caps off the year with a free download of a 'I Threw A Rock Into The Sea' - here, collaborating with Jana Eidse. It's not the first prominent collaboration with a female vocalist that Sheldrake has provided, as his initial "breakthrough" track featured one Anna Roo (seemingly an alter ego/alternate name of Andrea Vargas). That track, 'Rich', showcases the experimental and percussive nature of Sheldrake's repertoire. His latest effort, with Eidse, opts for a more conventional but equally special dose of hearty soul. Download 'I Threw A Rock Into The Sea' at facebook.com/cosmosheldrakemusic. Find more info at cosmosheldrake.com.